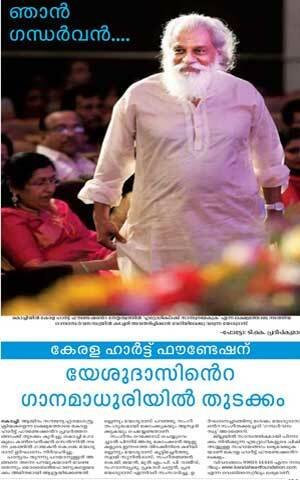 Sri.K.J.Yesudas is conducting a charity classical concert in Ernakulam on 6th April at Gokulam Park,Kaloor. The programme is organised by Kerala Heart Foundation. This is a fund raising programme to support economically poor patients who need complex heart surgeries and treatments like heart transplantation. DR.K.J.Yesudas will inaugurate the 1000 free heart surgery project of Kerala heart foundation.The entire money raised from this ticketed programme will be utilised for helping patients who need costly heart operations like bypass surgeries and heart transplantations. Patients who need to be benefitted from the programme can call 9996101446 0r register their requirements at the website www.keralaheartfoundation.com. Those who want tickets for the programme or want to sponsor patients can also call 9996101446 or email ckkkuldeep@yahoo.com. Tickets are available in BookMyShow too.